Akit's Complaint Department: The Glory Days of Protesting for Education - Yesterday's Day of Action was Weak! The Glory Days of Protesting for Education - Yesterday's Day of Action was Weak! In light of college and university budget cuts, many students, staff, and faculty decide to organize and have protests. When I look at the "Day of Action" that happened yesterday, there's that feeling that many students, staff, and faculty don't want to participate, and only a couple hundred actually participated at SF State's with only 100 marching from the campus to City College on Ocean Avenue. I remember back in March 2003 when a City College student organized one of the biggest rallies ever at the State Capitol building in Sacramento. Literally every single community college in the state participated and was bussed in to march from a parking lot and down the main road to the capitol building. 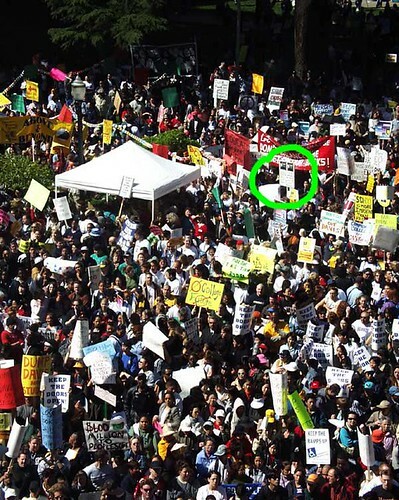 The green circle on the photo is of my sign in Sacramento; I used photos of Governor Gray Davis holding two sub machine guns. This protest was peaceful, and it was absolutely huge. It got the media's attention and we had tons of politicians on our side, and the protest was such a success that the proposed dramatic budget cuts was drastically reduced. The next year, Governor Arnold was in his first year in office and we did another march, but since I was now a junior student at SF State, a busload of SF State students joined our community college brothers and sisters for another successful protest in Sacramento. Once again, it was a peaceful event, and I had an absolutely great time. I'd have to say, those were the glory days of student protests. Large, peaceful, and had a dramatic positive impact on education. A lot of student protests in the past few years have came with a lot of negative publicity, and that bad rap also affects future protests, like yesterday's at SF State. I'm no fan of building occupations because while it grabs the attention of campus students, staff, and faculty by denying them access to offices, resources, and classrooms, it also shines a bad light on the students trying to make a point that budget cuts are bad. SF State's Business building's occupation was at the worst time ever, just weeks before final exams for the Fall semester. Sure, there was lots of people barricading the doors, and cheering on the students inside, but it sure pissed a lot of campus folks off that they had to move their office hours to other campus locations and the campus had to spend tons of extra money to relocate classes and have police officers there to finally arrest them. I remember protesting at SF State when I was a junior (it was a big rally) and students decided to sit in the middle of 19th Avenue and block traffic. I decided to stay on the sidewalk because I thought it is one of the dumbest ideas to block-off traffic on one of the city's biggest corridors. Some even went into buildings and pulled fire alarms to get people to evacuate and join the protesting, and I thought that was a poor decision too. When college campuses gets bad raps for protests, nobody wants to be part of it or participate. Sure, I support getting more funding for universities and colleges, but who wants to join a protest where students occupy buildings, get arrested by riot cops, pull fire alarms, and do other stupid stuff? When campuses have a good reputation of having very peaceful protests, more will participate in future protests because it shines a good image. It's tough to get students to protest as they don't want to miss a class, but when there's a good reputation, professors are more likely to let their students go and participate.